The centerpiece battle in Iron Cross is Stalingrad. This battle is accurately characterized as an infantryman’s fight, with over 15 German and 25 Soviet infantry divisions present. The difficult terrain of city fighting kept tanks and assault guns in a supporting role, leaving the heavy lifting to the foot soldiers. Within all of these infantry divisions there was also a lot of variety, with specialist troops on both sides brought in to deal with the challenges of urban fighting. The infantry formation options in Iron Cross and its command card deck give you lots of options to explore the variety of infantry forces fighting in Stalingrad and across the whole Eastern Front. Let’s have a look at the grenadiers in Iron Cross. Iron Cross features three infantry formations: motorised infantry that would become panzergrenadiers, the regular infantry known later as grenadiers, and the lethal troops of the assault pioneer battalions. 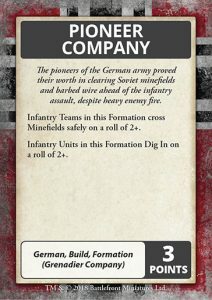 These three forces set the standard for the bulk of German infantry forces in Stalingrad, but there were more… lots more! 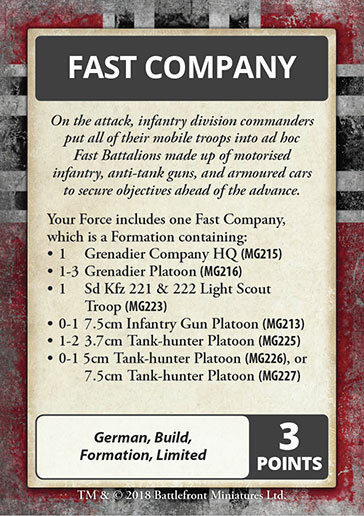 To cover as many infantry variants as possible, we’ve added several new command cards that converts your standard Grenadier company into a special unit. You can easily change the flavour of your units just by using one of these cards and adding or removing a few small things here and there. Each variant has its own set of advantages and challenges to explore, giving you many hours of entertainment. The 369th Croatian Reinforced Infantry Regiment fought in Stalingrad as a part of the 100th Jӓger Division. The regiment was oversized with reinforcements raised from Croatia. Loyal and determined to prove themselves, the Croatians fought hard in particularly difficult fights, such as the battle for the Red October Factory. During this fight, they worked closely with an storm group of the 179th Engineer Battalion. The German pioneers spoke highly of the Croatians, noting their steadfast determination to finish their assaults. This gives the Units of your Grenadier formation a better Counterattack rating, going from the usual 4+ to a 3+ to continue fighting assault combat. Infantry divisions tended not to be at the spearpoint of the German blitzkrieg on the Eastern Front. This was usually left to the highly mobile panzer divisions, but it sometimes happened that the infantry had to lead the way. To do this, they would form Schnell, or Fast, squadrons by pooling whatever armoured cars, tanks, trucks, and anti-tank guns the division could spare and attaching them to an infantry unit. This ad-hoc unit would speed ahead and secure critical objectives for the division. In effect, the unit tried to exploit weaknesses in the enemy’s lines, grab an objective, and then sit on it with plenty of heavy weapons until relieved by the rest of the division. The Fast Company command card lets you create one of these vanguard units. You will have some infantry and armoured cars to race ahead and secure the objective as well as a high concentration of anti-tank guns, including the formidable 7.5cm PaK40. If you pair this card with the Softskin Transport upgrade card for your foot-mounted troops, you will have tremendous mobility to grab the best ground on the battlefield well ahead of slower enemy infantry. The Gebirgsjäger were specialist mountain troops that fought primarily in the Trans Caucasian Mountains in the far south of Operation Blue. 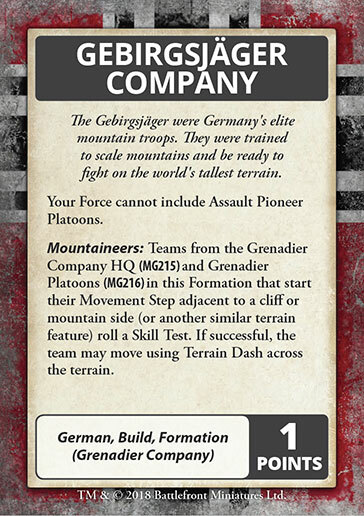 To operate in the mountains, the Gebirgsjäger relied on extensive mountain training to get places usually not accessible by normal grenadier forces. This gives them the Mountaineers special ability to scale cliffs and mountains that are impassable to other types of teams. This means that you can exploit these sorts of terrain to put your enemy on their back foot. Gebirgsjäger give up their heavy equipment in order to free up their supply lines and make it easier to get into battle. To that end, they replaced the typical 10.5cm artillery their own 7.5cm guns that they could break down and carry by mule through the difficult mountain terrain. You can field these guns using the Mountain Artillery command card to replace your 10.5 leFH18 guns with a battery of smaller 7.5cm guns. The 100th Jäger Division was similar to the Gebirgsjäger in their training to operate in difficult terrain. However, their focus was working swiftly in bad terrain, drawing on the long-standing German tradition of Jäger (hunter) troops. This training served them well in Stalingrad where they were able to maneuver more easily and be where they were needed the most to meet a threat or launch an attack. 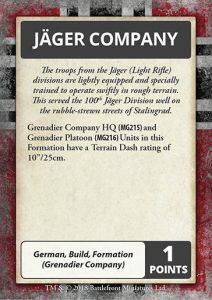 The Jäger Company command card gives your Grenadier HQ and Grenadier Platoon Units a Terrain Dash bonus of +2”/5cm, allowing you to get your combat troops to where they are needed more quickly, especially through a ruined cityscape. In 1942, Hermann Göring, leader of the German Luftwaffe (air force) raised 20 field divisions of infantry from spare personnel. These were well equipped with the latest weapons, including the new MG42 machine-gun to replace the older MG34, and 5cm PaK38 guns instead of the more typical 3.7cm PaK36 in infantry forces. East Front veterans would comment on just how keen and green these troops were marching into their first battle, only to see them shattered and broken hours later in the crucible of war. You can field one of Göring’s companies using the Luftwaffe Field Company card. You’ll see a sharp increase in the motivation of your troops but at the cost of training. 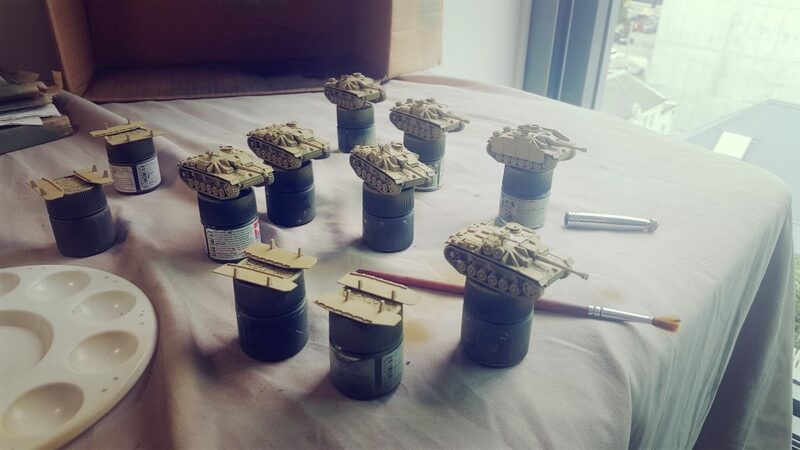 Engineer units were essential to the success of blitzkrieg operations. They secured bridges, swept minefields, and gapped obstacles for the assault forces to press the attack. 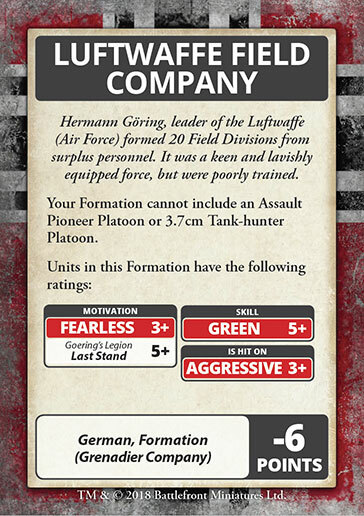 In Stalingrad and other city fights, the pioneers were called on to storm buildings, but these sorts of units are represented in the Assault Pioneer formation. 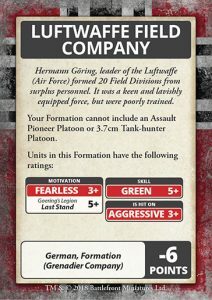 This command card focus more on the operational pioneer units where their job was more about clearing mines and digging in to hold a critical objective. Waffen-SS infantry units were not fighting in Stalingrad, however they were still heavily engaged in similar places like Kharkov. During 1942, these units were still SS-Infantry divisions, but, by being fiercely politically loyal, they were heavily reinforced with tanks and were generally well armed. Similarly, the Heer (Army) also had it’s premiere unit, Infantry Division Großdeutschland. Both the SS and Großdeutschland were well supplied, highly motivated, and considered elite, so the SS-Grenadier Company command card can be used to give both units a solid 3+ Fearless Motivation rating. 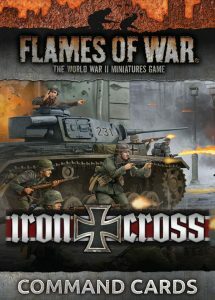 The Iron Cross Command Card Pack comes with 48 Command Cards. Not all of them are Formation Build cards like the ones shown above.